Keep in mind, The Hague Laugh occurs twice a month (every first and third saterday of the month). I've only posted some of the dates. If one date doesn't suit you, check the website tix4all website for other dates. Otherwise, don't miss out on all the fun and the laughs. 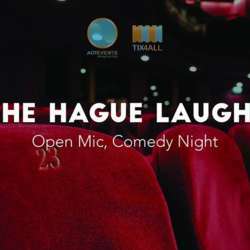 The presale for The Hague Laughs ! Tickets are €8 (excl service and payment cost) in the presale (and 10 euro at the door). The venue is open for drinks and appetizers at the bar beforehand and after.